Spotlight your company’s innovations, emerging technologies and products in a 30-minute presentation on the show floor. Giving a presentation at the Innovation Zone provides a powerful opportunity to establish your reputation as an innovator and expert. Show attendees are encouraged to stop by these seminars to learn about breakthroughs and best practices. If interested, please submit a 200-word abstract explaining how your innovative solution(s) would benefit attendees. Your abstract must include: presentation title, 200-word marketing description, speaker information and invoice details. A panel of industry experts will choose presentations via a competitive vetting process. At this time, the Innovation Zone is only open to exhibiting companies. The cost is $3,000 per accepted presentation. For more information, please contact Jessica Matsko, Coordinator, Administration & Trade Shows, International Dairy Foods Association via telephone at 202.220.3526 or by email jmatsko@idfa.org. PMMI has received reports from exhibitors of unofficial third-party hotel broker vendors. These brokers falsely imply they are affiliated with show management and ask for full pre-payment. The only company that is officially sanctioned and certified by PMMI to book hotel rooms on behalf of attendees and exhibitors is the ProFood Tech Hotel Reservation Office, Expovision. Expovision requires only a deposit equal to your first night’s rate plus tax. If you receive any suspicious solicitations regarding hotel reservations, please contact Expovision immediately at 866.523.0877 or 703.205.0480 or by email at profoodhotels@expovision.com. Affiliated companies are defined as two or more companies that are legally related entities, e.g. a parent and a subsidiary, subsidiaries of the same parent, or a corporation and a division. Booth occupants would be listed as separate entities in the same booth location. Each company receives their own listing on profoodtech.com and will be listed in the show guide. The cost is $750.00 for each additional affiliate company listing. Affiliated companies do not receive priority points for participating in the show. The deadline to submit an Affiliated Company Listing Form is February 1, 2019. Click here to access the Affiliated Company Listing Order Form. With 7,000 attendees at the show, 70% with significant buying power, you’ll need a plan of action to stand out among the crowd. View the 2019 sponsorship and advertising brochure and we’ll help you create the custom solutions to reach your target audience and achieve your goals. Click here to view the sponsorship & advertising brochure. For show-related advertising opportunities, contact your PMM Media Group sales representative or visit pmmimediagroup.com. 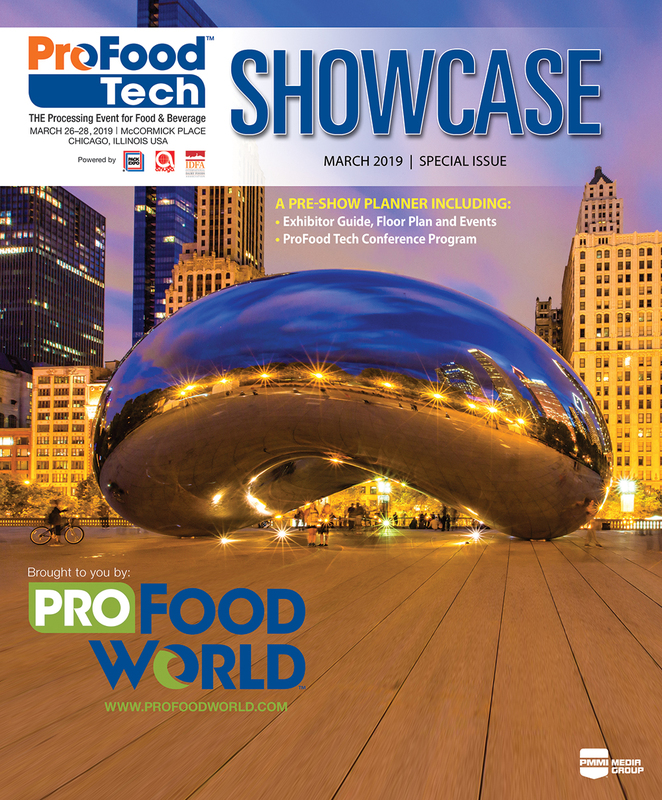 Leverage your exhibit investment by advertising in the ProFood Tech SHOWCASE, ProFood World’s popular pre-show planner, mailed to 25,000 food and beverage manufacturing professionals, including show pre-registrants. PMMI members earn a 10% discount. Maximize your company’s visibility before the show! Access the ProFood Tech logo suites and a range of banner options, including a personalized banner widget to help promote your presence to customers and prospects.